Glow in the dark paint is any kids dream. Not only can this paint transform any room into a starry wonderland at night, but can also be used for safety reasons, such as indicating pathways or walking trails, showing the direction to follow. Glow in the dark paint has phosphorescent properties, the colour and the duration of the glow will depend on the make of the paint and the ingredients used to make the glow in the dark paint. In earlier years when this paint was just discovered, it was made with radioactive materials, which was naturally a safety concern. Today, only non-toxic materials are used, making it safe for use. The way this paint works is interesting. When exposed to natural or synthetic light, the paint absorbs photons, which are later released, creating a glow. This process is called photoluminescence. The paint itself is usually a green shade or white colour. The glow in the dark paints can be pigmented with other colours, but it dulls the glow and the longevity of the paint. This paint can be used on walls, ceilings, metal and wood. Normal acrylic paints can also be tinted with a special powder to create a glow in the dark effect. Use stencils or create patterns to create a magical wonderland in your kids room. 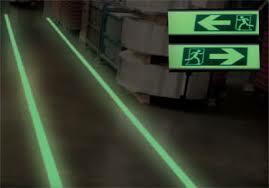 This paint can also be used as safety paint, indicating exits, elevation levels and other hazards, which will be visible in the dark. Phosphorescent paints have a sustained glow which lasts for up to 12 hours after exposure to light, but will eventually fade over time. 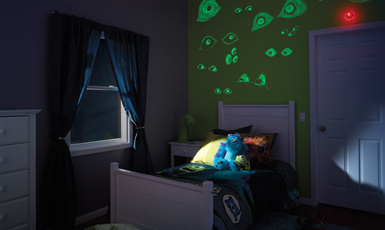 For more information and ideas on using glow in the dark paints, contact PROPAINT today!